Ringworm?! Mr. Murphy bids you farewell. If he's lucky, the most common fungus your cat will encounter is the rogue mushroom from a slice of pizza. Contact with the wrong type of fungus can send his skin into emergency mode. Antifungal shampoos are a common course of treatment when Mr. Murphy unfortunately is diagnosed with a fungal infection. Ringworm, one of the most often seen fungal infections in cats, has nothing to do with worms or any other worm-like parasite. Fungi facilitate the telltale circular areas of hair loss associated with ringworm. The ringworm fungus invades Mr. Murphy’s skin, hair and nails, and flourishes in the warm, moist environment they provide. 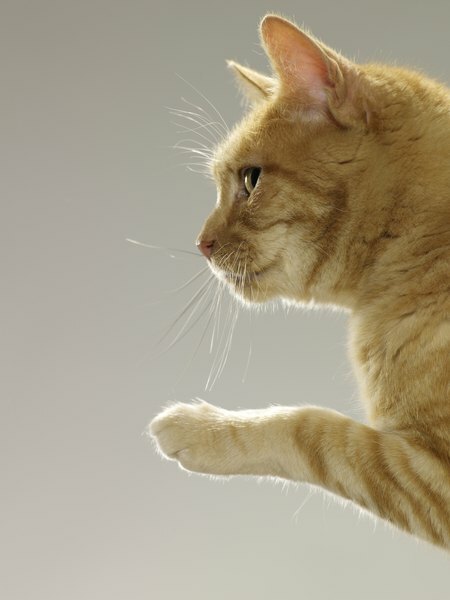 Infected cats typically show little signs or symptoms of ringworm infection other than flaky patches of hair loss that resemble dandruff; some may show no signs whatsoever. However, though he may be symptom-free, the ringworm spores Murphy sheds can survive in the environment for a year, and are very contagious to humans and other pets. Antifungal shampoo formulated with ketoconazole will help kill and inhibit the reproduction of ringworm cells, protecting you and your other pets from infection. A variety of yeasty organisms can cause your cat to become itchy, lose his fur, sport dandruff and develop quite the odor. One of the most dangerous fungi, Cryptococcus, grows in bird droppings and decaying vegetation. If Murphy ingests this fungus he will suffer weeping nodules on his nose and crusty sores on his head. Another type of yeasty fungus affecting cats, though less commonly, is Malassezia dermatitis. This yeast presents the more recognizable signs of skin infection, such as greasy skin (especially near the ears), redness, hair loss and a stinky foot smell. Try conditoning Murphy with a 50/50 vinegar/water mixture after bathing with an antiyeast shampoo, such as Malaseb or Dermazole, to keep the yeast at bay. Sporotrichosis is a fungal infection that comes from soil and organic debris, and usually enters a cat’s body via a puncture wound; single, indoor-only cats can breathe a sigh of relief. A cat infected with this fungus suffers from draining lesions on his head, legs and tail, lethargy and swollen lymph nodes. As a zoonotic disease, sporotrichosis is transmitted easily to humans. Consult your veterinarian immediately if your cat shows signs of sporotrichosis. Treatment for most of these fungal infections typically involves twice weekly baths with an antifungal shampoo. When used in conjunction with topical and ingestible antifungal medications, these shampoos reduce the numbers of fungus on the skin’s surface. Antifungal shampoos don’t provide a cure for Murphy’s fungal infection, but they do have an important role in managing the symptoms and spread of his infection. The active ingredients in these shampoos, such as antifungal ketoconazole, and mild disinfectants, like chlorhexidine, work together to kill fungus and wash away their dead cells. Your veterinarian will prescribe the proper type of antifungal shampoo for your cat’s fungal infection. Frequent bathing with Murphy’s regular shampoo, and antifungal shampoo baths at the first sign of infection may help prevent a full-blown fungus among us. Certain fungal infections, such as yeast, may recur if any underlying conditions remain untreated. It’s a good idea to keep a bottle of veterinarian recommended antifungal shampoo on hand as a precaution. If you're in a pinch, try a couple of drops of tea tree oil in his shampoo, or a bit of apple cider vinegar as a topical -- both are natural fungicides.